VUCA – volatility, uncertainty, complexity and ambiguity – is a popular acronym right now. It aptly reflects the world we live in, and the environment and circumstances that many organisations will have to cope with for the foreseeable future. 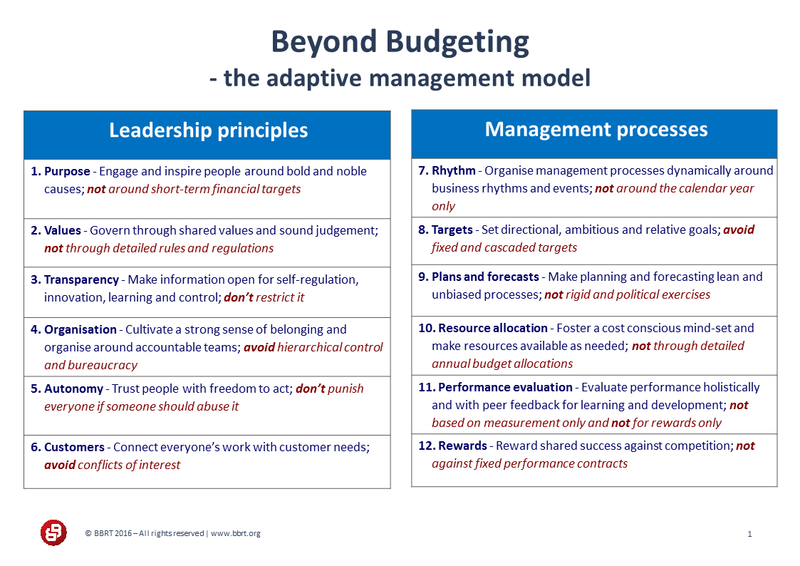 The Beyond Budgeting network began in 1998 and since then we’ve developed a management philosophy based on 12 leadership and process principles. This philosophy is all about helping organisations succeed in VUCA environments. The name Beyond Budgeting is somewhat misleading. The purpose is not necessarily to get rid of the budget, it is to create agile and more human organisations. This requires a radical change from traditional management, where the budgeting process and the budgeting mindset sits at the core. Hence “Beyond Budgeting”, but it might just as well have been called “Business Agility”. That is also why six of the twelve principles are about leadership. A core feature of Beyond Budgeting is the aligning between an organisation’s purpose, values and principles on the one hand and its day-to-day management processes on the other. Leaders have to “walk-the-talk.” We find that such cohesion is lacking in most organisations, and this has many negative side-effects such as inefficiency, poor decision-making, cynicism, bureaucracy and frustration. Better decision-making as resources are prioritised and allocated on an ongoing and event-driven basis. The Beyond Budgeting management principles include the most important leadership and process principles to be addressed to achieve an organisation’s full performance potential. They are based on significant research and our observations of what works (and what doesn’t) in practice. But as Beyond Budgeting represents a management philosophy and not a management recipe, the principles aren’t a checklist to just be ticked off and moved on from – they need to become a core part of your organisation’s ethos. Alignment between leadership principles and management processes is a key element of Beyond Budgeting; without such cohesion, organisations risk having serious disconnects between what is said and what is done, which is poison to any organisation. This explains the dual focus of the 12 principles. The purpose of the principles is to inspire and guide organisations as they strive to implement Beyond Budgeting. Anders Olesen will discuss how to implement dynamic processes according to the Beyond Budgeting principles at the Managing complexity: practical approaches to transforming your organisation session at the Bond Conference.